Funny you’re calling the first image above number 237 – I just posted a video on youtube regarding room 237 and that image starts it. The video relates the importance of the symbology of Neptune to room 237. Well, actually, it’s kinda artsy so probably doesn’t convey the message overly succinctly. But I started a new blog with a link to the video and the idea is related there. John, in my full analysis I present all shots (though not pics from) and lengths of time. The reason I call it number 237 is it’s the 237th shot in the film. No, it’s not coincidence, it’s an error on my part. I’m dyslexic and sometimes I simply don’t catch when I have turned a number around. I did a shot-by-shot analysis of the film and went over it with a fine tooth comb many times, and at different times, to make sure it was absolutely correct and to make sure that I would catch any dyslexic errors if there were any. But when I wrote the above post my dyslexia was apparently en force and somehow I saw every 5 as a 3 and didn’t catch the error in the post and I didn’t catch it subsequently, not until you remarked on the coincidence between shot 237 and Danny entering the room and I thought, “Huh? But shot 237 occurs in the Saturday section…” Then I looked at the numbers in the post again and realized my error. The shots that I had written above as being 237, 238, 239 etcetera in the above post should have been 257, 258, 259 etc. Shot 237 occurs on Saturday during an encounter with the girls in the hall. Wow – thank you for that. I did not know that trick. Very cool! 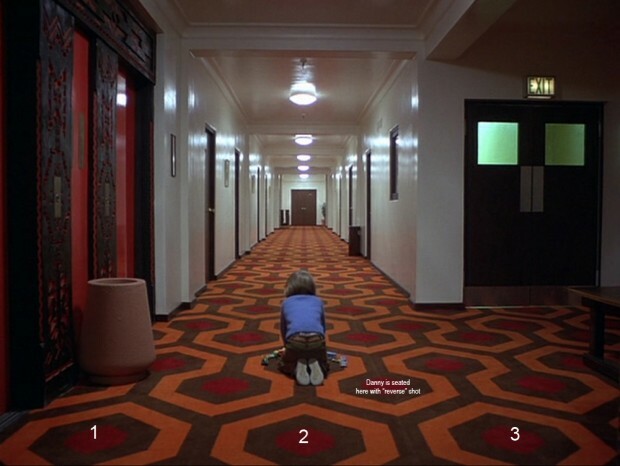 That’s very interesting, my friend and I were watching The Shining yesterday and she noticed how the carpet seemed much bigger. This explanation seems to make more sense, but i would like to point out that if this is correct then Kubrick also chose to move the couch. 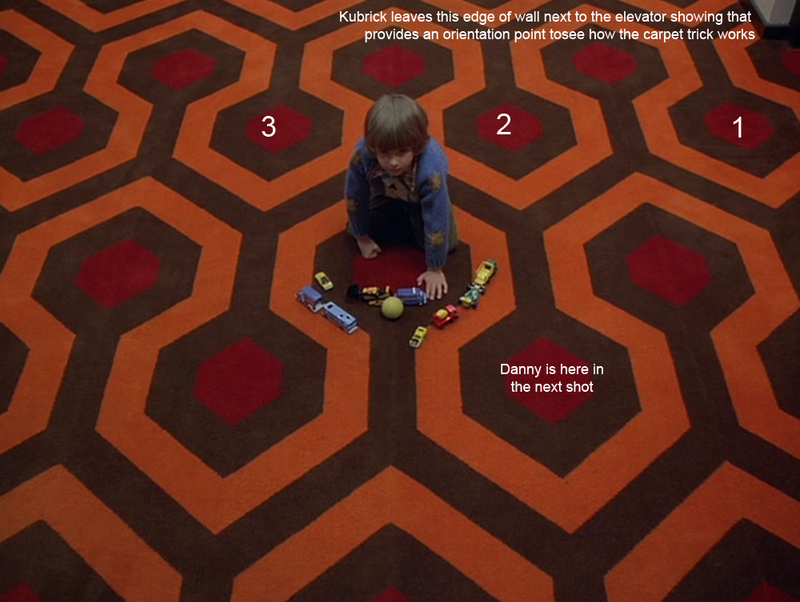 The couch is supposed to be to the left of hexagon 3 in shot 257, and should show up covering some portion of the carpet, but instead Kubrick decided to move it. Maybe to give more sense of space for dramatic effect? I certainly don’t know, but anyway i thought this was very cool explanation. I don’t think it was a mistake, or explicitly intentional. I think he just wanted a wider shot from above, where there would be more carpet, so it would look cooler. Simple as that. The most convenient way to do the shot, given the layout of the room, was to reverse the shot and put Danny in the centre. I don’t think it needs to have anything read into it, it’s just artistic license as a part of creative film making. Well, I think I really have to see this film now!! 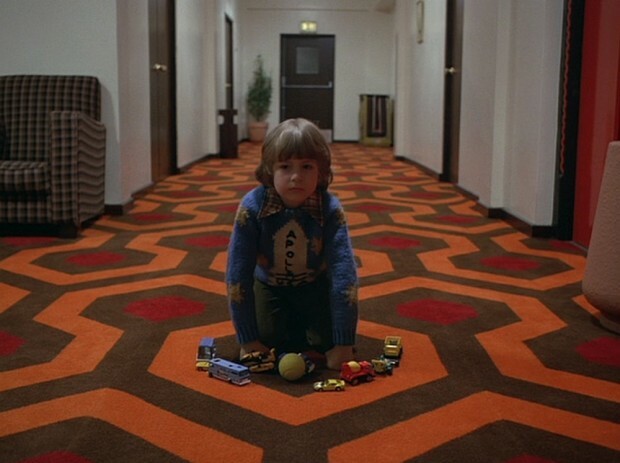 Love your analysis Julie and thought you might be interested in this – http://filmandfurniture.com/2017/11/kubricks-carpet-in-the-shining/ where we quote your article above.